The BRZ tS may provide even better handling than the already good standard car, but it still only has 205 horsepower and 156 lb.-ft. of torque. The car only weighs 2,798 lbs and this helps it launch from 0-60 mph in 6.2 seconds. By today’s high standards that just isn’t very quick for a sports car. In fact, if you compare it to the early Porsche Boxster you can see that the BRZ is pretty close to the same performance. The 2.5-liter Boxster offers 201 horsepower and 181 lb.-ft. of torque. The early Boxster weighs only 2,756 lbs. All of this helped the 986 Boxster manage a 0-60 mph sprint of 6 seconds flat when tested by multiple magazine, including MotorTrend. From a performance stand point the BRZ and 1997-1999 Boxster are pretty close, but the early Boxtser is a 20 year old car. Thanks to depreciation the 2.5-liter 986 Boxster can currently be had for about $7,000 in very good condition. Compare this to the starting price of $33,495 for the Subaru BRZ tS. Sure with the BRZ tS you get a warranty, but with the price difference you’ll have to do a huge amount of repair before the early Boxster gets even close to the same price tag. The thing that we would love to see is a bit more punch in the BRZ. It doesn’t need huge power because it is a good drive, but 250-300 horses would be just about right to help the Subaru BRZ feel quick when compared to modern competition. I wish that Subaru would evolve the BRZ by making tweaks and slight horsepower increases. They should take a page out of Porsche’s playbook and every few year bump up the horsepower so that the car feels a bit more sporty. 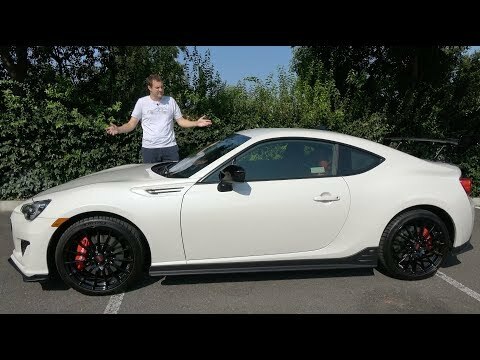 This video shows a compete review of the Subaru BRZ tS. Check it out and then scroll down to the comments and let us know if you think the BRZ needs more power.